The news from the high street and Britain’s town centres is grim. A shopping centre in Scotland is up for sale for £1, Marks and Spencer has announced a raft of closures, John Lewis is getting out of Southsea and sales in December were reportedly the worst for seven years. If some theatres think they have it bad, they should bear in mind that 11,000 major high-street outlets have closed in the past 10 years. So, what is theatre going to do about the death of the high street? This might seem an odd question for an industry that faces plenty of its own problems, and may feel the declining high street is not one to add to the list. But there are plenty of good reasons why theatre might be interested in consumers moving ever more towards online shopping. It means that the old model in which town centres were primarily given over to retail is going to change fast. Many theatres are in town centres and if these areas are in decline, will people still feel happy to venture to a building surrounded by boarded-up shops and ghostly shopping malls? So why not instead see it as an opportunity to think about the role that theatre and the arts can play in re-imagining the high street – not just as a shrine to consumerism but as a welcoming place of entertainment and participation? Punchdrunk once hosted a wonderfully atmospheric show in an empty Carnaby Street shop, and shopping malls can be a place for community activity and performance, or spaces where theatremakers can rehearse and create pop-up shows. In the process, theatre will be liberated from where it all too often lies – hidden behind walls – and come out into the heart of the community. It can get involved in the discussion around the civic role of the arts and ask questions about who gets to make art and where it gets made. Coventry’s Theatre Absolute has proved that setting yourself up in a disused shop in a shopping centre immediately makes you more visible and changes who you engage with. At the time it seemed to me “a very bad day for shopping, but a great day for art”. But afterwards, Helen Marriage, director at the show’s producers, Artichoke, told me I had been wrong. It had been a very good day for both art and shopping, as the vastly increased footfall to the city centre made the tills ring. 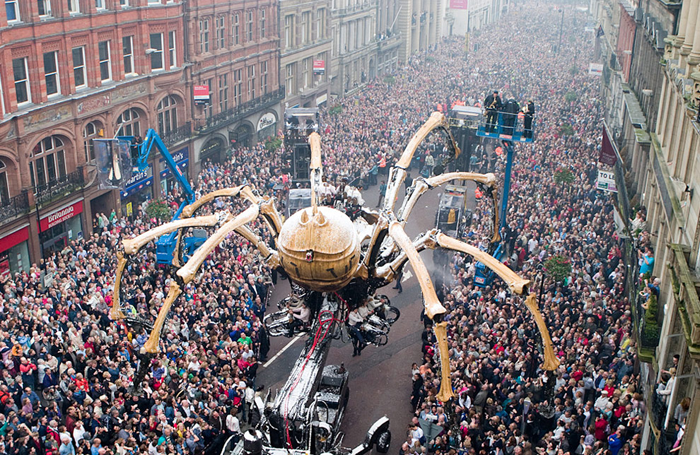 Liverpool has since hosted several other such events recognising that large-scale theatre events bring other benefits to the city including civic pride, increased tourism and full restaurants and hotels. After the 2008 financial crash, more disused shops became art galleries and performance spaces, at least on a temporary basis. But landlords seeking rent and councils looking for business rates income soon ensured that premises returned to commercial use. This time around, there is unlikely to be a return because shopping habits have changed so dramatically that the town centre is on life support. But there is plenty of data that shows people are hungry for new experiences rather than new things: a nation that once saw shopping as a day out is looking for other ways to get out of the house. That’s particularly true of families. Theatres are full of people who are creative, ingenious, fleet of foot and nimble of mind, who know how to make something out of nothing and how to deliver transformative experiences. It is often said that arts organisations need to be less like monasteries and more like town squares, but maybe this is the moment when theatres and theatre companies should be talking to councils about how they might actually have an active, visible presence in the town square, drawing in people and helping a town articulate how it sees itself now and in the future. After all, it is culture – not shopping – that binds us together.